Considering my initially negative reaction to Super Mario Sunshine, I think it's pretty amazing that I lived up to my promise and played it throughout the month of April. 1. The secret stages--Everyone seems to say these FLUDD-less levels are by far the best in the game. I don't entirely agree with that (because I think a number of the "regular" ones are stellar, too), but I definitely agree they're pretty great. Sure, they make my palms sweat as much as any other game I've ever played, but that just adds to the ecstasy I feel when I finally conquer one. 2. "The Sand Bird is Born"--Speaking of sweaty palms, when I first encountered this Gelato Beach stage, I was pretty sure I'd never beat it. That was OK with me, though, as the idea of playing it over and over and over again brought me more joy than you can imagine. What can I say? There's something magical about a level that takes place on the back (and side) of a soaring bird made of blocks of sand. 3. "The Wilted Sunflowers"--I wasn't sure if I should include this stage or the "Wiggler Ahoy" one from Gelato Beach when I started writing this post a few days ago. Because I already covered Gelato Beach in the bullet point above, I decided to go with this one, which is part of Pinna Park. Plus, it involves toppling egg-shelled turtles in order to revive wilted sunflowers. That said, I consider both of them to be surprisingly (and pleasantly) unique takes on the "boss battle" formula. 4. 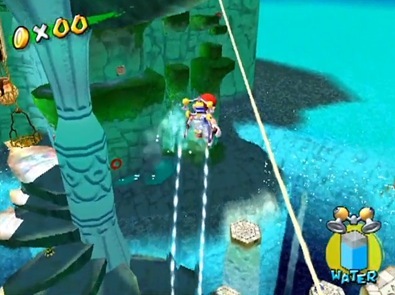 Noki Bay--As much as I love Gelato Beach and Pinna Park, I'm pretty sure Noki Bay is the first world in Super Mario Sunshine that quite literally caused my jaw to drop. To say it's gorgeous is like saying Peach's voice (particularly in this game) is grating. By the way, if the designers and programmers at Nintendo could pull this kind of thing off all the way back in the early 2000s, I'm pretty sure they'll be able pull off some similarly amazing things with the Wii U in the coming years. 5. Yoshi--Yes, Yoshi's inclusion in Super Mario Sunshine is, for the most part, pointless. (Or so I've been told--I'm not sure I'm far enough into the game to say that myself with any assurance.) Still, I'm glad someone pushed for him to be included, as I find riding the little fella around Delfino Plaza to be a joy unto itself. I know some of you are big fans of Super Mario Sunshine. If that aptly describes you, what are some of your favorite aspects of this summery three-dimensional platformer? Well, I'm glad the game has 'clicked' and you're having fun, witch is the point after all :). And excuse me if you've answered this already, but have you played Mario Galaxy 1/2? They both took some of the more wild ideas from Sunshine and just ran with them. Yes, that level/stage is soooooo epic, in my opinion. 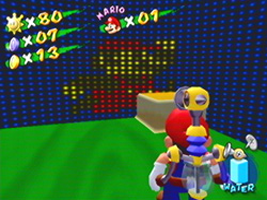 And so unlike something you'd find in any other game--Mario 64 and even Super Mario Galaxy included, I think. As for this game finally clicking with me: yes, I think you could say that. I still have issues with it, and I doubt I'll beat it anytime soon, but I am enjoying it overall. Oh, and, yes, I've definitely played both Super Mario Galaxy games. I beat the first one long ago, in fact. I've yet to beat Galaxy 2, but I've absolutely loved what I've played of it so far. Lovely list! I share your same thoughts about the secret/classic/whatever levels, they're great! (even if other stages were way greater, I remind mmhh an hotel one.. with Boos? I don't clearly remember). The game, from environments to musics is tremendously inspired, maybe the most characterized Super Mario to date (SM64 is firmly in my heart though). Anyway, glad to hear you're enjoying your trip to Delfino Island, where the only real thing I missed was more, MORE, WAY MORE WALL JUMPS! One thing I should have mentioned here that I failed to: the game's soundtrack! Sublime in nearly every way, don't you think? This is more like it! I'm really glad the game is starting to grow on you. That sand bird part really blew me away when I first saw it too. 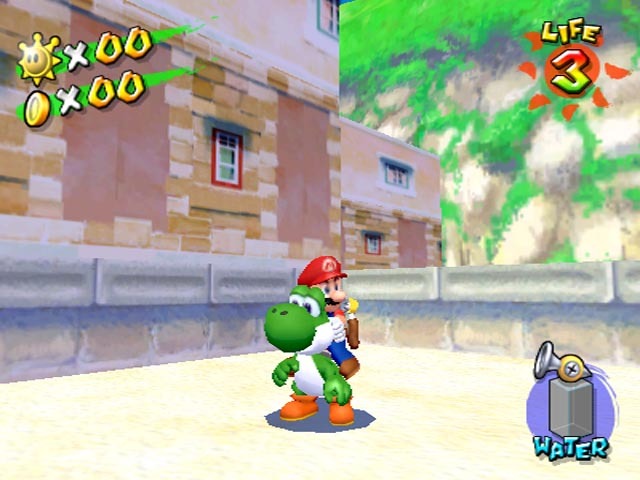 Yoshi really is just kind of shoehorned in there if you ask me, but I get such joy from the liquid physics and sound effects in Sunshine that I loved the juice spitting mechanic. Another really striking part was (I think) on Gelato Beach with the huge sun mirrors you have to reposition...very pretty. As for the hotel level, I can't remember much about it other than when you're outside and the sun is setting and everything is shadowed and atmospheric. One of the shines inside the hotel is probably the most vague and elaborate puzzle sequence I've ever seen in a Mario game. 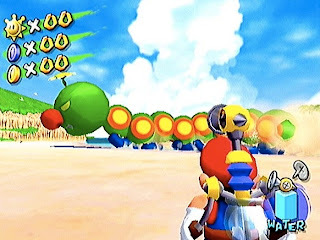 I also really liked the part of Gelato Beach that required you to reposition the sun mirrors--they're what prompt the Wiggler battle, I think! Anyway, I like pretty much all of Gelato Beach, I think. I can't say I'm looking forward to that hotel shine talk about here, by the way. Vague and elaborate? Groan!! Oh, yeah, it's a beauty, Justin, no question. Also, the first shine took me some time to acquire, let me tell you! It didn't piss me off like some others, though. In a way, I liked having to figure out what I was doing/where I was going. YES! I'm glad you finally got to that point. That's where I was in Ricco Harbor, when the game finally clicked for me.